16 years ago, Lale wrote a play about Henrietta Lacks . . .
With respect to the immortality of the black woman Henrietta Lacks and the immortal cell line, known as HeLa, that came from Lacks's cervical cancer cells in 1951, the whole work of Lale was influenced. She felt uncomfortable to work with human cells, so she started a project with sponge cells, which led to the construction of a DIY Sponge Cell Printer in the year 2008. The problem was that the sponge cells cannot be reproduced, this is why Lale switched to E. coli bacteria’s in 2016. 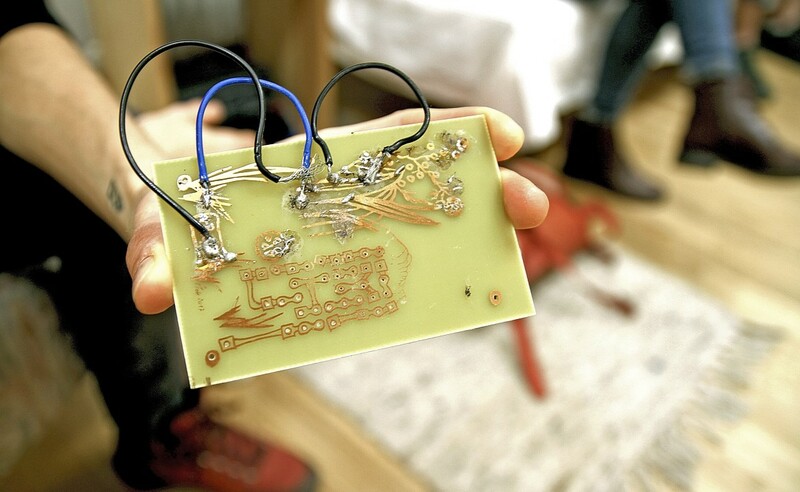 It was an important change for her current work with the future lab in the Ars electronica. Her project will probably be related to sound that can be manipulated by the people through a platina. She presented one of those functional platina’s during the session. She will continue her writing on the play and connect it with the research of the cells and her believes in a collective knowledge. Last semester Andrea presented a short film about transhumanism. Some of the footage can still be used for her current installation that deals with politic systems and the power of the state over our life. Her goal is to build a machine that fakes a health scanner and is run by a fake company named OSIRIS, that tries to sell you their product. Andrea built a website with a face recognition software (free software from amazon) to make the people believe that this is a real machine that recognizes them. The people have to follow a protocol and will receive an output, that tells them if they are worthy to use the medical tools from OSIRIS or not. The company offers you a service for a longer lifespan, to get smarter, be healthier etc. All this takes place in an utopian scenario that Andrea generates around the participants. Jasmina already did two projects with “street anamnesis”, but this time she wants to dig deeper into the psychological processes. She will start a cooperation with the psychologist Thomas Wenzel, who will help her to understand not the anamnesis itself, but the process behind it. Her work is strongly influenced by the believes of Robert Bresson, a French film director who was obsessed with reality. Through his thoughts and believes, Jasmina tries to reveal the secrets hidden behind the context of the street anamnesis. She will try to transport her empirical and practical knowledge collected through the processes, into an animation movie.